I miss my friend. I miss his clever conversation and interesting ideas. I miss him teaching me to be a better person and guiding me on that path. At times I felt the roles were reversed, but that is what friendship is. Two people helping each other along the path of life. He was and is my friend and I love him dearly. I miss my friend. Born in North Carolina, and raised in Florida, he benefited from great parents and a warm and friendly environment. Earned a Bachelor of Fine Arts Degree from the University of North Carolina, Greensboro. Achieved the rank of 2nd Class Aviation Electronics Technician as an enlisted member of the United States Navy. 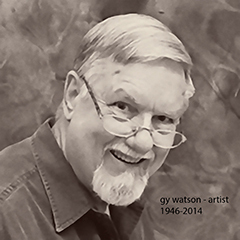 Through college, the military and further business training he nurtured a natural affinity for art and technology into a career in the photographic and computer industries. Eventually, this led to his own business combining graphic arts, printing, and computers. George entertained a dual fascination with texture and three-dimensional constructions utilizing a variety of sources and techniques, all digital in nature.